Florentine painter, sculptor and draughtsman, a universal genius who was architect, town planner, inventor, scientist, writer and musician. Leonardo Da Vinci was the natural son of the notary at Vinci, then under Florentine rule. His extraordinary gifts were soon apparent and he was apprenticed (c. 1470) to Andrea Verrocchio, leading Florentine artist. His fellow-apprentices were Lorenzo di Credi and Botticelli. Little is known about this period except that Leonardo Da Vinci came under the patronage of Lorenzo de' Medici and in 1472 became a master, a member of the Guild of St Luke. In 1482 Leonardo Da Vinci entered the service of Lodovico Sforza, Duke of Milan, where he was active as court painter, sculptor, architect and military engineer until the fall of Sforza in 1499, when the French armies occupied Milan. Leonardo fled to Mantua, then to Venice, where he was employed as a military engineer. In 1500 Leonardo Da Vinci went to Florence, 2 years later joined Cesare Borgia in his campaigns, but on Borgia's defeat returned to Florence, where he remained until 1508. 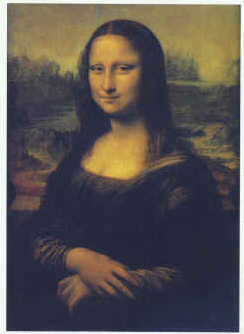 The Mona Lisa was painted in Florence between 1503 and 1506. In 1508 Leonardo Da Vinci was recalled to Milan by the French governor of the city, Charles d'Amboise, and for 5 years was occupied with scientific studies and plans for the construction of a canaLeonardo With his pupil and assistant, Francesco Melzi, he travelled to the Vatican in 1513 to seek the favour of the Medici Pope Leo X, but left disappointed in 1517 to join the court of the French king, Francis I. In Rome Leonardo Da Vinci was surrounded by intrigue; in France, however, he was greatly appreciated and admired.